Trading is 90% emotion and new money is always scared money. Was/is cryptocurrencies the first thing you ever traded? Was it maybe the first thing you invested in that you saw insane returns on? How amazing did it feel when you bought your Bitcoin at $2,000 last July and then see it 10x in December? You weren’t alone in that feeling. And you weren’t alone in knowing that. And you weren’t alone when/if you were holding from the $20,000 area down to the $5,000. And institutions and experts know it more than you do. 1. Did anyone buy here? Did anyone participate during this date? There is no price here. It’s not needed. The only thing we need to see is the elevated volume here. The only thing we need to see is that the prices that rose here no those dates. And that the highest volume bars were selling bars. What was going on here? Expert traders, institutions and funds were selling to you the euphoria, they were selling their cheap Bitcoin stake to new money who were buying at the top of a market. They wanted to not just sell to you here, they wanted to trap you. 2. Look at this volume desert. 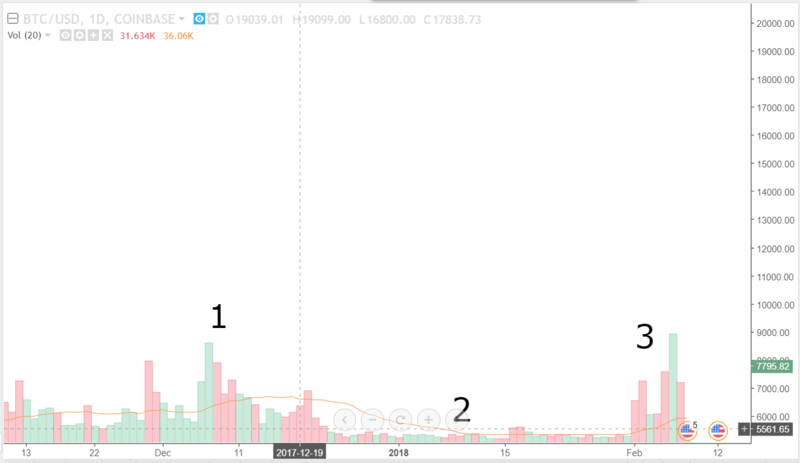 This is the most important place on the chart after the time cycle. You know what this entire volume area represents? Fear. Terror. Anxiety. Depression. Sleepless nights. Sick feelings in the stomach. Day after day of prices going lower. False hopes. False bounces. Your crypto friends don’t sound so happy. Some are afraid and its making you nervous. You can’t stop but keep looking at the chart even though it hurts to look. You want to keep holding. Prices keep dropping. You start a mental gamble and tell yourself things like, “This will get better. It has to. Odds are this can’t keep going.” You hate that people keep saying hodl. This area is where accounts, pigs (pigs are new money, amateurs and people who got trapped up top) and hope goes to die. It is meant to be painful and slow. It’s market torture. 3. This is the beginning of another accumulation phase. The veteran and expert traders, funds and institutions know they’ve either killed off the pigs or kept them afraid. You know what’s worse than being a dead pig? The hodler pig that is still around. That hodler is the one who is going to cause the next rise. That hodler is desperate, afraid and determined to get revenge. When they finally reach a break even point or an acceptable loss point, they don’t have the stomach to remain in, they leave and continue to offer cheaper Bitcoin to the expert traders, funds and institutions. I’ve been through hell to become a true independent and solo trader from my home office. I know the suffering and painful experience of losses. Cryptocurrencies are violent and excessive in their swings. But you need be more excited about falling prices than you are about rising prices. Currencies are the most speculative market in our lifetime. If you worry about the money you lose/gain in this market, you have already consigned yourself to giving your money away. You are nearly guaranteed to lose at some point. You need to assume that any and all money you invest/trade in cryptocurrencies is gone already. You need to take the approach of a long term value investor. Be happy when prices are rising, be very happy. But be happier when prices drop. Desire and hope for lower prices. Look forward to drops and bad news and horrible drag downs. Learn to love those environments and embrace the cheaper positions you will be acquire over the long run.